“The Counter Espionage Department” a former police station that was used as a torture center especially to suppress democratic activities and carried investigation with torture by secret police officer from 2 October 1976 until 21 July 2005 transformed into the home of the victims of human rights violations known as National Policy Agency Human Rights Protection Center to heal old wounds, “reborn” police to protect people’s human rights and a memorial for those who died while involving in pro-democratic activities. During 1980s, many pro-democratic activities were banned and activists were tortured and were forced to make false confessions on spying for North Korea. 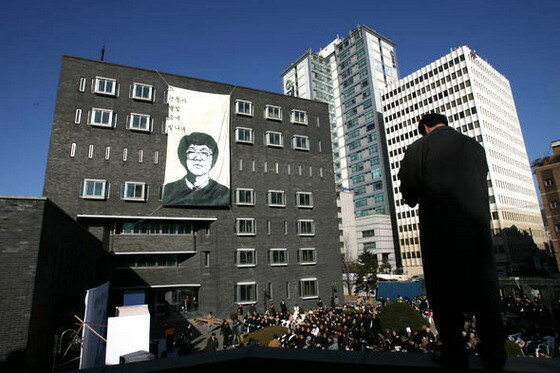 As a result, a student, Park Jong-chul at Seoul National University was killed by the secret police in room 509 from extreme tortured with water and electricity shocks, while interrogation during the military regime in 14 January 1987. “This was not a first case of human rights violation in the South Korea since military regimes. There were many activists, students and civilians who died, but death from torture was the most horrific one” says the director of human rights protection center, Mr. Jang, Sin-Joong. However, the secret police report says that the student died accidently when the officer hit on a desk in an investigation room. “People were laughing and it was totally unbelievable” says Professor Hyo-Je CHO who was accompanying with us during our field trip to the center. “How a person can die just hitting on a desk by an officer” he added with a surprising face. Later the authentic result was published with the help of NGOs and CSOs. All of these incidents within 30 years forced to transform the tortured center to human rights protection center in 22 February 2005. The main purpose of the center is to protect and promote human rights education among police. “Despites of any changes including the change of government, we want to open intrusive human rights in the country although it’s very challenging” respond superintendent, Sohn Chang-Hyon to the participant’s questions. In doing so, the center has published a book for police, conference to police where one police who worked to protect human rights are awarded (A female police was awarded recently), human rights training for riot police, compulsory human rights training for all police, systematically collect the tortured record of 30 years and published them so that the police won’t repeat the torture in the future. Recently, the center lobby the government to protect human rights including freedom of speech and movement in Bhusan but “we failed and this is our limitation” respond by both the director and the superintendent of the agency. Interestingly, the building also contain a meeting room where civilians can hire the room in advance with free of charge for educational purpose such as a class for human rights educations, meeting related with Human rights and so on. Personally, I am very amazed and inspired by the work of the center which has only 8 staff in the center. It clearly shows that the size really does not matter while you are working for positive change what matter is the work you conduct in the name of People or for people. I hope to have this center in the country like Nepal and many more where human rights have been violated during the restoration of democracy.